The Clean Air Council filed a suit which sought to prevent Sunoco Pipeline from using eminent domain for the Mariner East 2 pipeline. A Philadelphia County Judge denied the Sunoco preliminary objections. Sunoco Pipeline asked the Commonwealth Court for the opportunity to appeal that Order. On June 21, 2016 the Commonwealth Court denied the Sunoco request to appeal. The Clean Air Council will now move forward with the suit seeking and order to prohibit Sunoco from attempting to use eminent domain power for Mariner East 2. Opposition to the Atlantic Sunrise pipeline has focused on the absence of a public need for the pipeline. Dr. Dennis Witmer has supplied evidence refuting the asserted public need for Atlantic Sunrise. 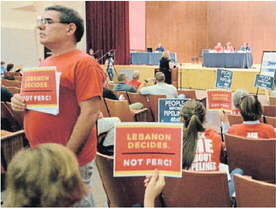 He also testified to the absence of a public need for the Sunoco Pipeline Mariner East 2 pipeline. The Federal Energy Regulatory Commission continues to evaluate the Atlantic Sunrise proposal. Faherty Law Firm represents many property owners threatened by the Atlantic Sunrise proposal. As low prices for natural gas cause drillers to pull up stakes, companies are building conduits to move fuels to ports. Midstate residents are trying to stop the projects. The energy boom of the last decade has, in the last year, grown eerily silent. The drilling of new wells has slowed with the fuel supply outpacing demand and low prices dogging the market.